Sinnott and Fitzgerald, who won the clutch match in the semi final, found themselveds two holes down after seven holes, but wins at the 8th, 9th and 10th saw the Munster pair take a one hole lead early in the back nine. Their control on the match was tightened when they went 2up on the 15th and when Fiona Fitzgerald holed a tricky six-foot putt on the 16th green, the green pennant and Spanish Tourist Board sponsored Irish Mixed Foursomes trophy was heading to the south-east. 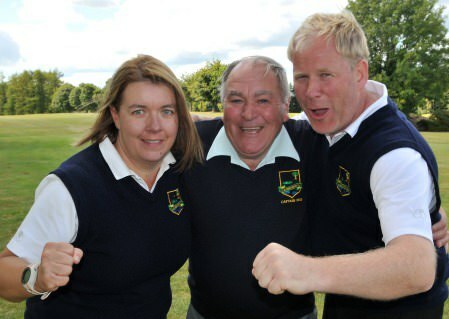 Denny Sinnott & Fiona Fitzgerald bt Ken Hovenden & Maria Downey 3/2. 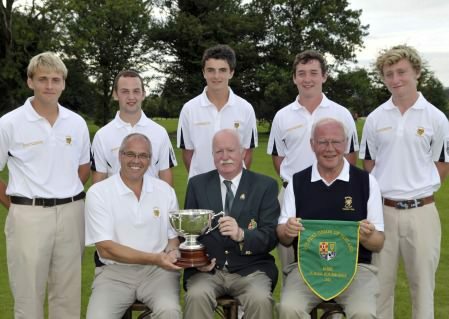 Bangor retained the Irish Junior Foursomes title with a hard-fought four-hole victory over Galway in the All-Ireland Final at Castlewarden. Claremorris captain Brendan Mellett (centre) celebrates with team members Christina Rush and Ger Noone after the club’s victory in the I Need Spain sponsored Irish Mixed Foursome Final on the 16th green at Douglas Golf Club. Picture by Pat Cashman/www.cashmanphotography.ieClaremorris claimed the I Need Spain Irish Mixed Foursomes with a clear-cut 4-1 victory over Newlands at Douglas.